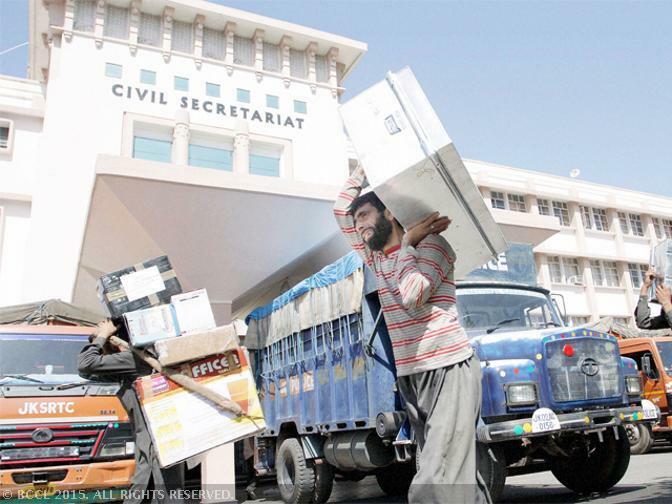 The Civil Secretariat and other Darbar Move offices function in Srinagar for six months of summer and in Jammu for the remaining six months of the year. Civil Secretariat, the seat of Jammu and Kashmir government, closed here Friday and will reopen in winter capital Jammu on November 05 as part of the biannual ‘Darbar Move’, a practice started by the then Maharaja Gulab Singh in 1872. “Civil Secretariat and other Darbar Move offices closed in Srinagar today (Friday) and will now reopen in Jammu on November 5,” an official spokesman said. The practice was started by Maharaja Gulab Singh 145 years ago to escape the extreme heat of summers in Jammu and biting cold of winters in Srinagar. However, the practice was continued by elected governments in order to provide access to people of both the regions — by turns — to the seat of power in the state. The State government spends crores of rupees every year to shift voluminous records between the two capital cities twice a year, besides paying similar amount as allowance for the several thousand employees who shift base with the government. There have been demands from various quarters to abolish the practice and set up permanent civil secretariats in Jammu and Srinagar cities so that people can get redressal to their problems round the year while saving substantial amount of the public exchequer. Meanwhile, the government has established a winter secretariat in Srinagar for the convenience of the people. The practice of having a winter secretariat here was discontinued by the previous government. According to an order issued by the General Administration Department earlier this week, the winter secretariat would be staffed with one special secretary or additional secretary, one deputy secretary and other required subordinate staff.